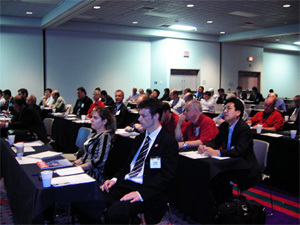 Daiwa Can Company made the speech at the Cannex 2007 on April 26 (U.S. time), as the first speaker. 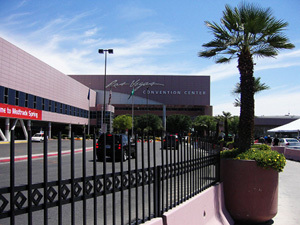 · The Cannex 2007 was held at the Convention Center in sunny Las Vegas, Nevada, U.S.
· As one of the events during the Cannex 2007 held from April 25 to 27, the Canmaker Conference took place from April 26. After the president of Sayers Publishing Group Ltd made the opening speech, Mr. Hirosi Endo from Daiwa Can Company made the honorable first speech. · He is engaged in technical development as the Production Technology Manager of the Technical Center of Daiwa Can Company. 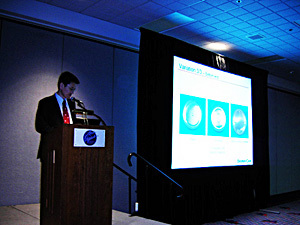 He delivered a lecture about the resealable metal can that Daiwa is proud of to the audience under the title, "The resealable can and evolution in metal packaging," at N241 Meeting Room in the Convention Center. · The lecture was delivered in English for about 30 minutes, using PowerPoint. · He explained the process of the development of the epoch-making resealable metal can that would completely change the lifestyle of the people in the world, as well as the features, specifications, production process, reduction in environmental load, and future development concerning the present New Bottle Can, Mini Bottle Can, and WORC Bottle Can, describing the direction that future metal containers would take. Taking this opportunity, we would like to thank all the people who gathered at the hall. 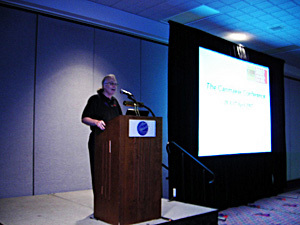 Outline of Daiwa Can's presentation in the Canmaker Conference at the Cannex 2007 "The Resealable Can and Evolution in the Metal Packaging"
Daiwa Can delivers the presentation entitled "The resealable can and evolution in metal packaging" in the Canmaker Conference at Cannex de las Américas Convention.